Here’s a good example of a Burmese “modern song” that shifts back and forth between Burmese and Western instrumentation and style. 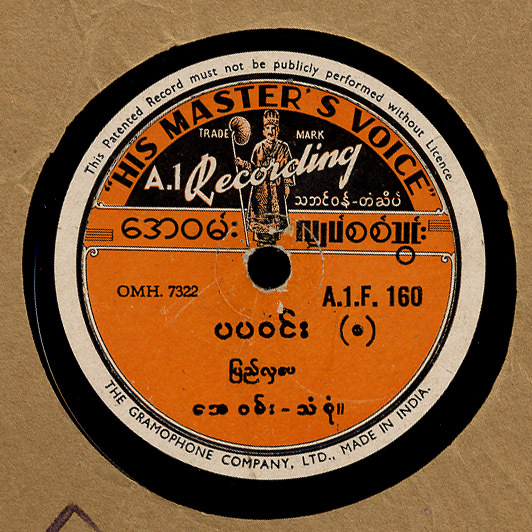 This record features the well known singer Pyi Hla Pe who was also a member of the Ministry of Culture. The Ministry of Culture was formed in 1952 to promote traditional culture and recently made the unfortunate ruling that Western instruments cannot be in traditional hsain waing ensembles. Although this song doesn’t feature a hsain waing orchestra (a classical ensemble with gong circle and xylophones), it does include Western instruments such as piano, Hawaiian guitar and violin. Since this is a two part song, I’ve included both sides of the record in one mp3 file. Thanks to the excellent Burmese pianist Sandaya Aung Win (Phillip Aung-Win) for help with this post. Absolutely fantastic blog! Found you via Zorch. Can’t wait to delve into your selections!